Exhibitors can give about 20-minute presentations at the ground floor of Yokohama Creativecity Center (YCC). 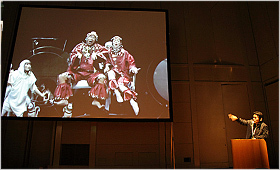 In addition to video presentations, actual performances can also be shown. We look forward to participation of such players as performing arts companies or artists, public venues, national and international festivals, production companies or cultural institutions. *DVD or Laptop(with VGA) are available as presentation tool. *Registration was finished. Thank you. *The exhibitor fee of Visual Presentation includes 2 passes. For participation of more than 3 people, additional purchase of pass(es) is required. *Please note that the number of exhibitors is limited. February 18*Order is not yet fixed. Ballet Pixelle(TM) is a professional ballet company that performs in virtual and physical realities. Our goal is to explore and extend physical and virtual dance and movement and to blend these realities. We present neo-classical, contemporary, and eclectic works with all original animations, choreography, and musical scores. The works are presented in real-time with virtual/digital dancers, musicians, and physical dancers from all over the world. The company is beginning its fifth year and works in the global digital community called Second Life(R). CCDC is the flagship modern dance company in Hong Kong and is the most important modern dance platform in contemporary China. Since its establishment in 1979, CCDC has inspired and elated audiences in Hong Kong and around the world with world-class performances. CCDC is renowned in reflecting the vigour and creativity of Hong Kong’s multifaceted contemporary culture and has presented over 200 original works to critical acclaim and earned 187 international invitations to the world’s foremost dance stages and festivals. In recent years, CCDC has joined forces with BeijingDance/LDTX and the Guangdong Modern Dance Company in presenting several influential modern dance festivals in China. 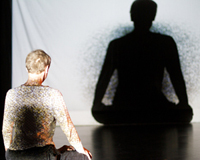 Founded in 2005, Mancopy is one of the few dance companies in Denmark offering contemporary dance year-round. With a repertory including works of Bjerregaard and acclaimed choreographers from around the world, this small, full-time company performs at home and abroad to ever-growing audiences. Our aim is to forever expand, artistically as well as culturally, creating art projects beyond the performances. Mancopy’s repertoire continuously incorporates new styles and methods of creation and performance. While productions have always been grounded in contemporary dance, the choreographic approach integrates the experimental within the more traditional. After traveling around the world, like prospectors panning for gold, we have brought back from our journeys live shows that are very different. What they all have in common is that they have moved us, touched us, amazed us. Shows that were born in different countries for a universal audience. We are hoping to share with you moments that bring us back to the heart of our humanity and remind us of how important and necessary art is to being human. Lighthearted and sincere, our intention is for audiences to be swept away with unforgettable memories that they will keep forever in their hearts. A comedy duo, GAMARJOBAT have challenged silent comedy on the conception of a nonverbal style for a decade. They launched out “Silent Theatrical Company GAMARJOBAT Project” which is a mass of performers who seek potential for silent comedy without a single word. The company trains talent who is capable of performing on stage and produce a unique professional company to be good enough to perform all around the world by means of mime with hidden potential. Organization: NELKE Brains & Hearts inc.
Yumiko Tanaka is an unusual shamisen singer and performer. 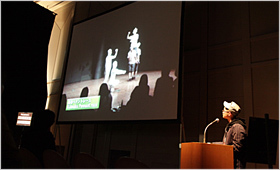 She presented a music performance ‘tayutauta’ in December 2010 in Tokyo, in which she combined experimental music, Japanese traditional music, dance, puppet manipulation, visual images, and lighting. She makes a presentation about that music performance. Performed by Yumiko Tanaka, Yoshihide Otomo, Seiichi Yamamoto, Kyo Ichinose, and Yukio Suzuki. Commissioned compositions by Yuji Takahashi, Yoshihide Otomo, and Kyo Ichinose. We play mainly in Kyoto. Our play centers on two playwrights. The first is straight play written by Yorihuziyuki, the other is Grand Guignol written by the leader. Our goal is to connect the future to the past in our play. SOSUSHIMAI was formed in 1990 in Tokyo. We have been creating theatrical performance as an experiment on society forming which starts with rules. In our creation, we invent new rules for game, in things like language and physical activity as communication tools, or in human relations. Then actors play games to create society under the new rules. In the early days, our performance were formed by scenes improvised in the games, however nowadays, there are stories close to real world written by Takemi Koike. We always aim to amaze audience by showing a world which people have never seen. February 19*Order is not yet fixed. DAZZLE is a dance company with a slogan “Vague DAZZLE that belongs to all categories and does not belong to any category” that keeps creating productions with the incomparable worldview and originality. They fuse street dance and contemporary dance into their own original style, which is one and only in the world. By soaking up not only dance but also elements of Japanese culture such as art, fashion, music, literature, film, comic or game, they will continue to drive for the development of new dance entertainment originated from Japan. The Original Tempo (TOT) was founded in 2002 by Worry Kinoshita. With a central focus on overseas performance, the re-mix performance over play, music, and dance is getting to be a big hit internationally as the next-gen piece condensed Japanese young culture. Non-verbal performing using voice, body, water, cardboard boxes, TV, etc is reputed as the entertainment that repaint usual day into art. Our representative work Shut Up, Play!! was prized five-star in Edinburgh Festival Fringe 2009 and was invited to Singapore Arts Festival Flipside . ‘Dance Passage’ is a new dance form to merge ideologies and techniques of dance in the East and the West. Artistic Director, Saoi Inoue has been propelling the project, “The New Wave of the Arts,” through collaboration works with artists from categories other than dance since 1995 (“Art’s Birthday,” “International Dance Communication JAPAN,” etc.). Now the project is ready to expand its interchange through the dance works with artists outside of Japan. We recently see hand disinfectant everywhere. We used to think that it was fastidious a while ago, but we have accepted that by now. As we form a barrier to keep us away from the dirt, the barrier keeps us away not only from germs but also relationship to others before anyone knows, don’t you think? In this dance work, we express some attempt to break or build an invisible wall between us. Founded in 2001. Hyottoko-Ranbu’s performances are centered on Junichi Hirota’s original plays, and have nearly reached its tenth anniversary. Fast paced in its productivity, the company has created the average of three performances annually. Over the years, Hyottoko-Ranbu has developed a theatrical style making use of casual conversational dialogue and exaggerated poetic language, integrated with physical performance. Hyottoko-Ranbu is noted for the phantasmagorical use of ensemble, taking in elements of music and dance such as clapping and collective dance. It aims to a theatre where rhythm and speed, energy and looseness intermingle. Since the opening in 2004, the Museum has presented productions of powerful originality, beyond any art forms and taken place at the whole facility as a stage. We also put emphasis on residency for new creation as well as establishing the network of other organizations to co-produce new works and co-host overseas performances. The Museum of Art, Kochi was established in Kochi City in 1993. We hold excellent art works by both domestic and foreign artists. The Museum Hall, also functions as a Noh stage, holds approximately 15 shows a year, including dance performances, theatrical plays, films, and concerts. Mirei Yamagata was an actress in Minneapolis, USA until 2003. She studied Butoh extensively with Dairakudakan from 2004 to 2006, and in 2007 she danced a solo in the Kazuo Ohno Festival (Yokohama). In 2010, after performing her solo 55 Minutes of Improvisation - My Body and I and What Lies Beneath in Tokyo, she was a resident artist at Hooyong Performing Arts Centre in Korea, where she performed Shreds and Traces. In November 2010 she danced in the Asian Performing Arts Festival (Tokyo). She is constantly searching for the balance between “to move” (learned from Western technique) and “to be moved” (learned from Butoh). Sara Gebran is a choreographer, performer, dance teacher & city planner. Called cultural activist for the community projects done in refugee camps in the West Bank, Copenhagen and Stockholm suburbs in collaboration with Ylva Henrikson & Anders Paulin.